traveling at 55 mph while on a solo training ride. It put a bunch of things into perspective for him. 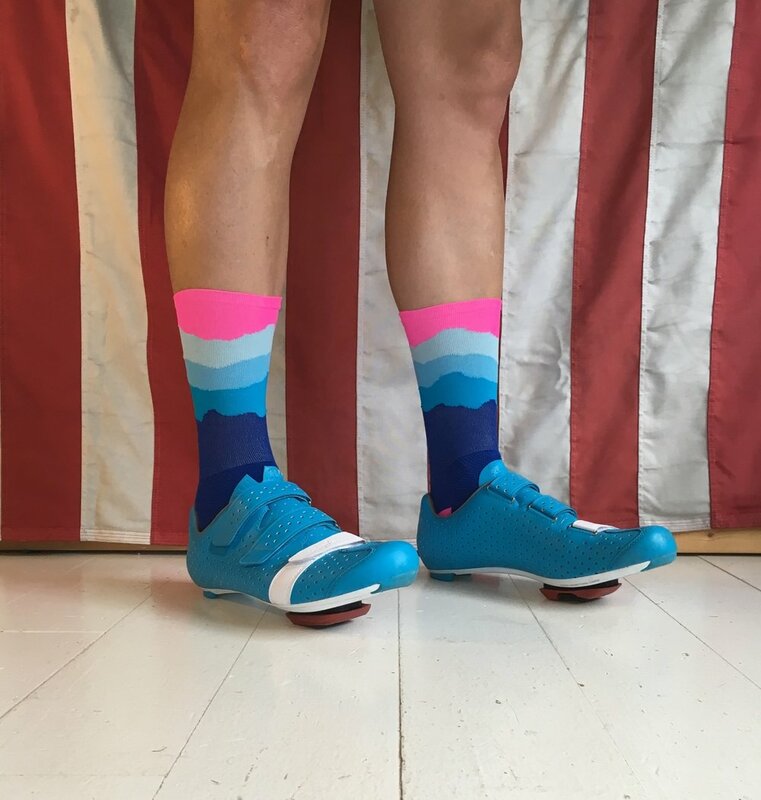 the first socks landed in late July of 2015. Blue Ridge mountains. The Blue Ridge is home to some of the best cycling terrain in the world. it stays with you forever. Our first offering THE SKYLINE sock is homage to those shades of Blue. 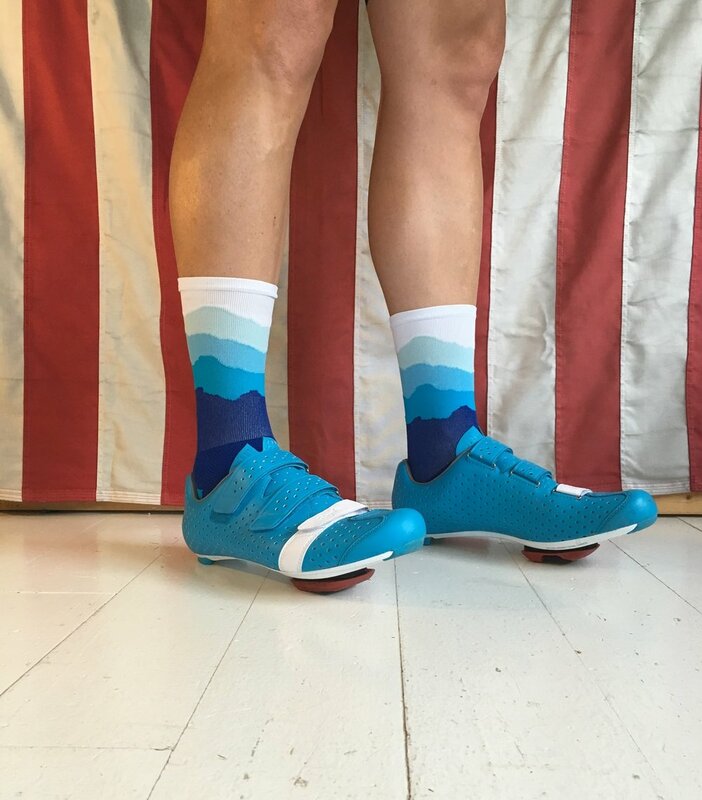 RIDGE SUPPLY is striving to produce the finest cycling apparel to help provide WATTS FOR THE SOLE. THE RAINBOW - The Rainbow is all about Color. 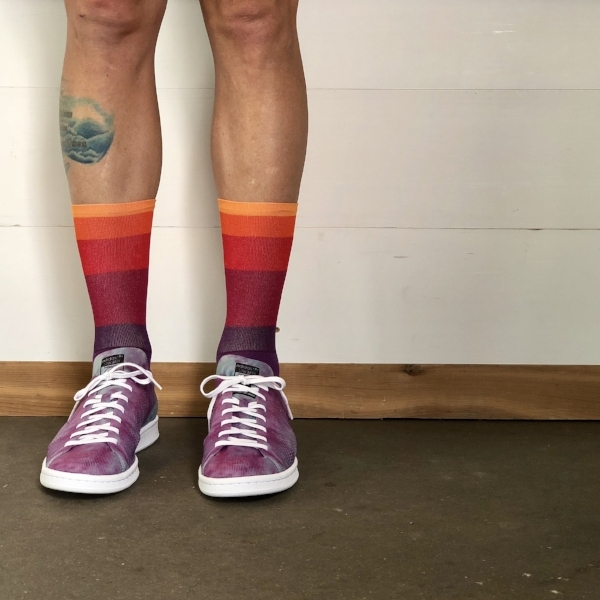 We added two more colors to the Skyline Design to give the classic ROYGBIV. 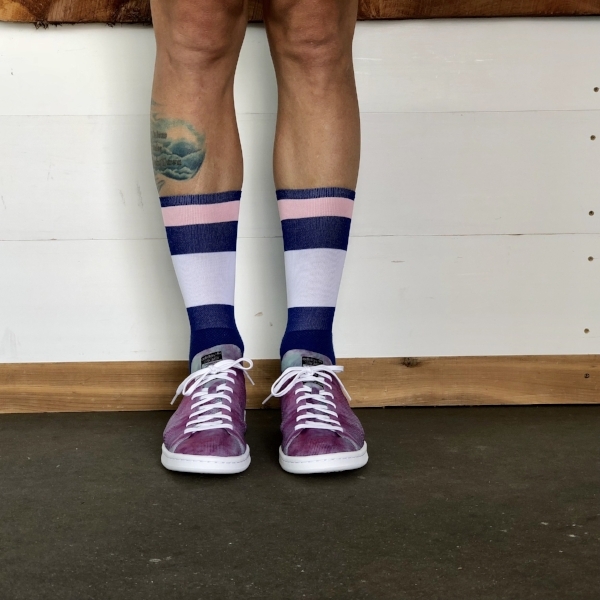 THE SKYLINE - ORIGINAL is the sock that started it all. Five Colors: Royal, Process, Carolina, Star, and White. 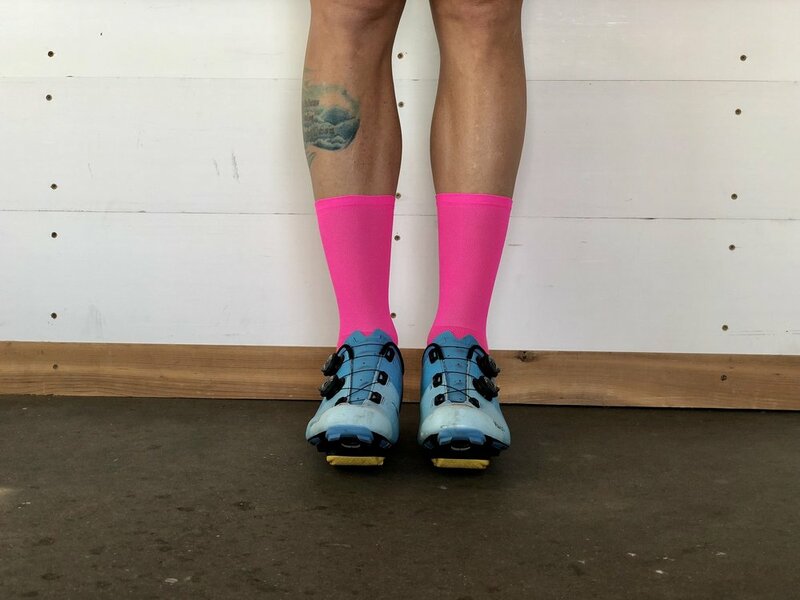 THE SKYLINE - PINK EDITION is the Skyline Dawn + a POP of Hi-Viz Pink to keep you seen on your ride. THE SKYLINE - YELLOW EDITION is the Skyline with a POP of Hi-Viz YELLOW to keep you seen on your ride. THE SKYLINE - NEON GREEN EDITION is the Skyline Dawn + a POP of Hi-Viz Green to keep you seen on your ride. THE SKYLINE-URBAN CAMO is the Skyline in shades of URBAN CAMO with Space Dye URBAN CAMO Coolmax on the foot to keep you seen on your ride. THE NEON RIDGELINE - PINK is the Ridgeline Dawn in NEON PINK to keep you seen on your ride. THE NEON RIDGELINE - YELLOW is the Ridgeline Dawn in NEON YELLOW to keep you seen on your ride. THE NEON RIDGELINE - GREEN is the Ridgeline Dawn in NEON GREEN to keep you seen on your ride. 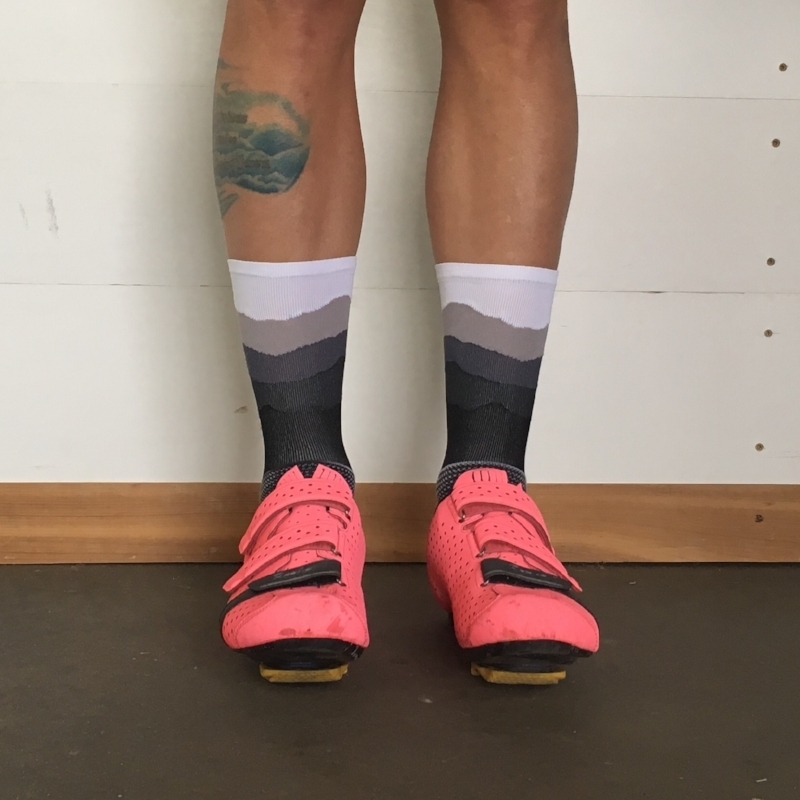 THE ALPINE - PINK MIST EDITION is an all new design that captures the mountain vibe from all angles with our Pink Mist colorway to keep you seen on your ride. THE 20% -NEON ARSENAL is the 20% in shades of NEON representing the #bethebright colorway of Arsenal - Process Blue, Neon Orange, Neon Pink, Neon Green, Neon Yellow. THE 20% -AUTUMN is the 20% in Plum, Cardinal, Scarlett, Orange, & Pumpkin. THE 20% - CUPID is the 20% with Royal, White, Royal, Light Pink & Royal… made for the wedding of Allie & Carson, two lovebirds who met via Ridge Supply. THE ERRYDAY NEON YELLOW - All Neon Yellow 6" Single Cuff Aireator. Made in North Carolina. THE ERRYDAY NEON PINK - All Neon Pink 6" Single Cuff Aireator. Made in North Carolina. 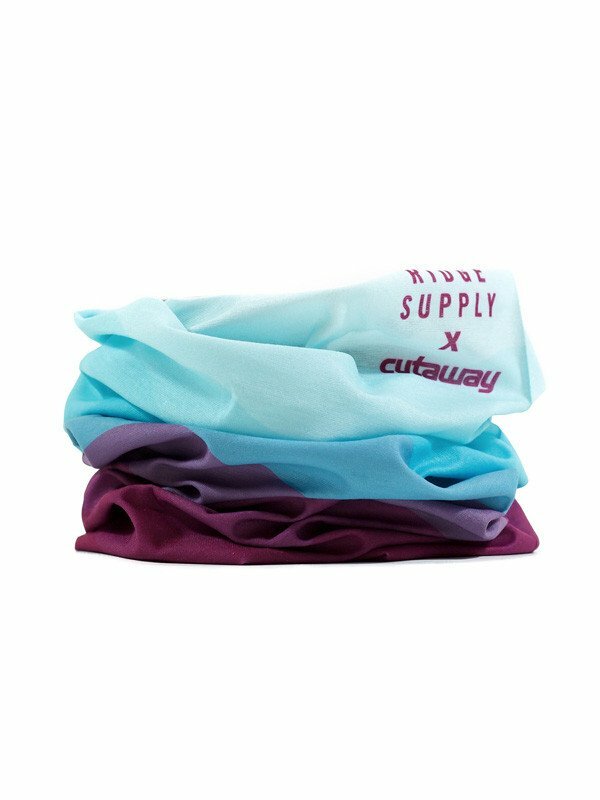 MIST BLUE NECK GAITER - Lightweight and versatile neck gaiters are the perfect accessory. Can be worn as a traditional neck gaiter, a skull cap, headband, face protector, or under the helmet. TRANS PINK 22OZ PURIST BOTTLE - Purist infusion shields the bottle from taste, mold, and staining. Nothing sticks so your bottle stays clean and your water tastes pure. DAWN CLEAR 22OZ PURIST BOTTLE - Purist infusion shields the bottle from taste, mold, and staining. Nothing sticks so your bottle stays clean and your water tastes pure.